Over the past two years, Western mass media has engaged in an active disinformation campaign against Russia, alleging in particular that Russia is violating the INF Treaty, which would also mean infringing on the interests of SRT (Strategic Missile Troops). In particular, Russia is accused of alleged violations of the INF Treaty in connection with the test of a prototype of a new Russian ICBM (intercontinental ballistic missile), the RS-26 "Boundary". Such a charge was made in an article in the Washington Times newspaper in July of 2013. As a justification of similar claims, the assumption is made that this missile is an intermediate-range model. However, its first successful SOA-up with a monoblock head travelled from Plesetsk to Kamchatka, which is an intercontinental range. It is alleged that the SOA-up passed from Kapustin Jar in the district of Balkhash with a multi-charging head piece on a truncated range – a characteristic for missiles of intermediate-range. It should be noted that it is already well-established that the maximum distance is determined by a projection of flight trajectory on the globe which, from the point of a SOA missile of this type, is the point of a falling warhead with the range of a ballistic missile. Such an understanding was already developed long ago within the framework of the SOA (Strategic Offensive Arms) agreement and is enshrined in the operating Agreement on SOA-2010 (Chapter 1, item 12 “Terms and their definitions” - the Protocol of Agreement SOA-2010). From this point of view, at least one SOA-up prototype of the new missile with a range of more than 5500 km can unequivocally render it an ICBM class. Thus, the missile falls under action CSOA-2010, but is acceptable in regards to the INF Treaty. In referencing this, the term "intercontinental ballistic missile" means a land-based ballistic missile with a range of over 5500 km (Chapter 1 item 25 “Terms and their definitions” the Protocol to CSOA-2010). The term "intermediate-ranged missile" means a land-based ballistic missile or a land-based cruise missile with a range exceeding 1000 km, but not exceeding 5500 km (item 5 of the Art. II of the INF Treaty). The US was subsequently seemingly compelled to admit this fact. Now, according to the mass media, the report of the Center of the U.S. Air Force on space investigation (Air Force Intelligence Report Provides Snapshot of Nuclear Missiles) argues that the new Russian missile is tested for intercontinental range, and thus prior information alleging that Russia broke the INF Treaty is faulty. This report was commented on by Hans M. Christensen, the director of nuclear information at the center of the American Federation of Scientists. So, the US no longer insists that this was a question of violating the INF Treaty on ICBM RS-26 tests. However, the US is now speaking of certain Russian land-based missile activity which is beyond the INF Treaty. On July 29th, 2014 the official representative of the White House, Josh Ernest, reported that the US President sent a letter to the President of the Russian Federation notifying him that the US accuses Russia of violating the INF Treaty. Nevertheless, the Obama administration did not divulge any information on how Russia allegedly broke this agreement. In the letter, however, Obama did express interest in high level negotiations for the purpose of saving the agreement. According to mass media reports, Obama later broached the subject in a personal telephone conversation with Vladimir Putin. Concerning the American allegation that Russia violated the INF Treaty, the Ministry of Foreign Affairs of the Russian Federation stated that such a charge is totally “unfounded”. “Once again the US has attempted (and again very clumsily) to act as a lone mentor who is somehow in possession of the ultimate truth, grading a subordinate” – read a statement by the foreign policy department of Russia. In other words, American claims are put forward without any evidence; they are based on strange conjectures and unscientifically predetermined conclusions without any subjection to expert analysis. The probable aim of all this is to burden the countries of the world with disinformation, to saturate the mass media with a kind of “propaganda soup”. Perhaps illusion is still strong in the Obama administration and perhaps Washington, to paraphrase the Ministry of Foreign Affairs, is really living in its own little world. This comment reminds one of the numerous times that Russia has had to verbally defend itself against the many slanderous accusations coming out of Washington. In the context of the INF Treaty, it reminds one that it is necessary to deal with any problems which may arise in a cooperatives spirit, without resorting to bombastic or “megaphone diplomacy”. Nevertheless, unfounded accusations against Russia have spread widely due to the large influence of the mass media. These charges were willingly accepted by NATO, and the statements of NATO’s Secretary General, Anders Fog Rasmussen, particularly testify to this unfortunate fact. In one such statement, the Russian Ministry of Foreign Affairs noted that it is “a little at the wrong door”. “If the essence of concern is with the observance of the provisions of this document, it was not necessary to address us, but rather one of the member countries of the North Atlantic Alliance being party to the agreement”, the Russian Ministry of Foreign Affairs emphasized. “If the Secretary General of NATO would seriously like to make a contribution to strengthening the mode of dialogue on the INF Treaty, we would recommend that NATO should give the agreement a multilateral character in favor of which Russia has repeatedly acted”, the Russian Ministry of Foreign Affairs noted. “In our opinion, the North Atlantic council should provide a suitable platform in which it would be possible to call in, as the first step, allies to consider such a possibility”. On September 11, 2014 in Moscow, Russian-American interdepartmental consultations on the subject of the INF Treaty took place. On the American side was the Deputy US Secretary of State Rose Gottemoeller; the Russian side was represented by Mikhail Ulyanov, the director of the department of non-proliferation and control questions of arms headed by the Russian Ministry of Foreign Affairs. The parties discussed their concerns over the implementation of the agreement and possible ways to eliminate any problems that could arise. However, according to Mikhail Ulyanov, Russia did not receive satisfactory answers in connection with the alleged violations of the INF Treaty purported by Washington. Mr. Ulyanov confirmed to Moscow that Washington is manipulating the supposed launch of a cruise missile with a land-based range of 500 km. "Unfortunately, we do not have full clarity concerning what sort of a claim they have against us. It is believed by the Americans that allegedly, some time ago, we carried out a test of a cruise missile forbidden by the agreement, but we don’t have any more information than that", Mr. Ulyanov reported to RIA Novosti news agency. The head of the Center of International Security’s Institute of Mathematics and Economy of the Russian Academy of Sciences, Aleksey Arbatov, explained to Independent Newspaper that there are questions regarding the alleged tests of the land-based R-500 cruise missile. According to information released by the mass media, the representative of the American delegation could not provide any evidence of Russian violations of the INF Treaty. The American side merely once again declared that the data available to the US "is exclusively authentic" and that there cannot be any doubts regarding the data’s objectivity. Similar views have been expressed by Washington in its ongoing anti-Russian information war in connection with the events in Ukraine. The US State Department, in turn, voiced that its concerns concerning Moscow’s following of the agreement have not been dispelled. Nevertheless, during consultations, the parties confirmed the importance of saving the INF Treaty and agreed to continue dialogue on the elimination of remaining divergences in one format or another. The majority of experts consider the information released on supposed violation son the INF Treaty to be related to the general sharpening of Russian-American relations due to the events in Ukraine. First of all, such allegations resemble a psychological threat whose purpose is to put greater pressure on the Russian Federation along with all the additional sanctions. It is therefore possible to assume that there are other motives for the American "charges" against Russia. It is impossible to exclude that one of the purposes of the American military-political leadership in this disinformation campaign consists of preventing Russia from creating new effective responses to counteract the American AMD global system. Among such new systems is the ICBM Boundary weapon, which the Deputy Prime Minister of the Russian Federation Dmitry Rogozin called “the murderer of the AMD”, meaning that it is able to intercept both existing and prospective anti-missile defense systems. Among them is the operational and tactical Iskander complex which, in the November 23, 2011 statement of Russian President Vladimir Putin, was designated as a means of defeating the AMD system in Poland via the missile complex in the Kaliningrad region. The attempt by Washington to deflect criticism from its own numerous and real violations of the agreement can be one more reason why the Americans are hurling allegations against Russia concerning imaginary "violations" of the INF Treaty. There was also one more point of view among Russian experts: the American charges against Russia (on the violation of the INF Treaty) are being urged in order to establish the preconditions for a unilateral exit of the US from the INF Treaty, and the expansion of intermediate-range missiles up to our borders. The idea of a US exit from the INF Treaty has been brought up in Western mass media as well. For example, according to RIA Novosti news agency, “The agreement on missiles of intermediate and short range became outdated even before violations from Russia” ("The Wall Street Journal", 9/11/2014). Here the author urges the US to leave the INF Treaty and to update the arsenal so that it corresponds to the global responsibility of the country. In this context there were solutions proposed at the last summit of NATO in September, 2014 (held in Newport) regarding the strengthening of the eastern flank of the alliance, which is to say the strengthening of the military presence of the alliance near the borders of Russia. Western politicians’ proposals to dismiss the treaty obligations ratified by NATO in the Fundamental Act of1997, which stipulates that groups of armed forces and nuclear weapons will not be placed on the territory of new NATO states, also fit in this context. Meanwhile, the expediency of the INF Treaty of 1987 which was concluded on an indefinite basis has also been repeatedly called into question. 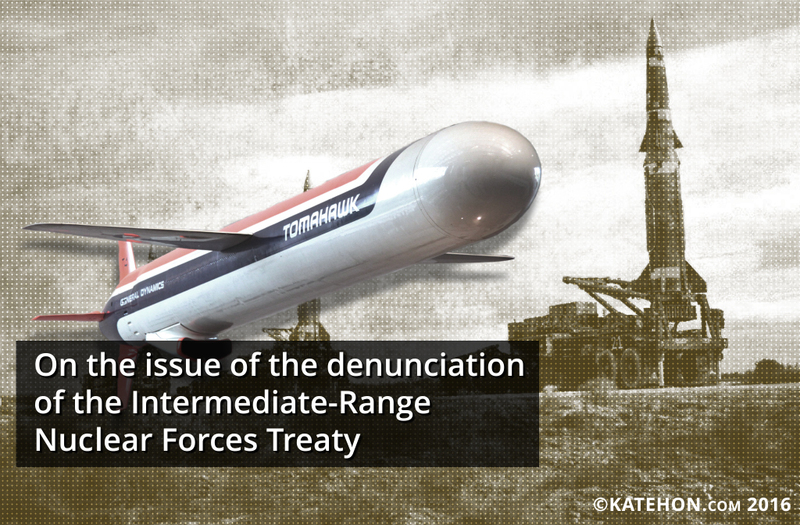 The question of the denunciation of the INF Treaty has already been discussed periodically in the mass media, and among experts and politicians. For example, this question was actively discussed in Russia in connection with the first wave of NATO’s expansion, its aggression against Yugoslavia, the potential exit of the US from the AMD Agreement, and plans for the expansion third item region of the US’ AMD in Europe. Denouncing the INF Treaty has been supported by a number of high-ranking Russian state and military figures. In 2005, the influential British newspaper The Financial Times published an article referring to sources in the American administration which confirmed that during a visit to the US the Russian Minister of Defense Sergey Ivanov discussed with US Defense Secretary Donald Rumsfeld the possibility of Russia leaving the INF Treaty. Thus according to the newspaper version, the Russian proposal to withdraw from the INF Treaty did not cause objections from the US. This article spawned a mass media polemic, but only denials came from official circles. According to the relevant statement by the head of the US military department’s press service, “The United States is the country which has signed the agreement, against its cancellation or an exit from other countries”. And Alexander Yakovenko, the official representative of the Russian Ministry of Foreign Affairs, spoke of the “commitment of Russia to the INF Treaty”. In 2006, the chief of the 4th central research institute of the Russian Ministry of Defense, Major General V. Vasilenko, answered questions posed by “Interfax", stating that “the expansion of intermediate-range land missiles is one of the ways by which the principles of national security can be ensured.” In his statement, he paid special attention to not contradict the position of the Russian Ministry of Foreign Affairs. In considering the question of expanding intermediate-range missiles, it is necessary to make a rounded military-economic analysis. According to information spread by the mass media in 2006, during the subsequent meeting of the Russian Minister of Defense and the US in response to D. Rumsfeld’s initiative on using warheads to fight against terrorist threats, S. Ivanov introduced a counter-offer on the re-equipment of a part of intercontinental ballistic missiles in order to use missiles of intermediate-ranged against the terrorists. On February 10, 2007 the President of Russia, Vladimir Putin, in his well-known speech on safety policy issues in Munich, pointed out that a number of third world countries have created intermediate-range missiles, and yet the US forbids Russia to have systems of this class under the INF Treaty. Then, the Minister of Defense of Russia S. Ivanov, in conversation with journalists in Munich, called the INF Treaty a "relic of the Cold War". In 2007, the possibility of Russia abandoning the INF Treaty as a response to plans of expanding the third item region of the US’ AMD in Europe was alluded to by the chief of the General Staff of VS Russian Federation, Yu. Baluyevsky. The commander of RVSN, N. Solovtsov, making comments on this subject, also noted that RVSN is prepared for any developments in the situation. “If the political decision to exit the agreement is made, then RST will be ready to resolve the issue,” Solovtsov said. The Head of the Russian Ministry of Foreign Affairs, S. Lavrov, commented on the statement of the high-ranking military official, declaring that it does not mean that any final decision has been taken: ”In this case it is not a question of any already accepted decision. We are simply ascertaining the situation". On October 25, 2007, the Joint Russian-American statement under the INF Treaty was announced during the 62nd session of the General Assembly of the United Nations. In this statement, the Russian Federation and the US urged each other to discuss the possibility of giving a global character to the INF by refusing other countries the right to have missiles with ranges of 500-5500 km, and pursuing the destruction of any such missiles along with the termination of any related programs. This subject was also mentioned by the President of the Russian Federation, V. Putin: "It is necessary to give the agreement a global character. If we cannot reach this goal, it will be difficult for us to remain within this agreement while other states are actively developing such systems of arms, including the states which are in close proximity to our borders", the President declared. These words were interpreted in the mass media as the prevention of a possible Russian exit from the INF Treaty. In 2013, at a meeting with representatives of the military industrial complex, the Russian President V. Putin remarked that Gorbachev's decision to sign the INF Treaty was “at least disputable”, though he added that Russia will observe this document. In 2013-2014 S. Ivanov, already the acting Chief of the Russian Presidential Administration, also criticized the INF Treaty. In particular, he declared that the INF Treaty was disputable, and that it cannot be observed indefinitely. The Russian Ministry of Foreign Affairs, nevertheless, has officially and constantly emphasized Russia’s commitment to the INF Treaty. Nevertheless, a large number of supporters of a denunciation of the INF Treaty can be found among experts. In addition, the idea of amending the INF Treaty has been expressed in the expert community. Re-negotiating the INF Treaty has been voiced among experts with the aim of assigning Russia a special, valued recognition by the US and NATO in regards to Russia’s right to maintain an arsenal of regional-ranged missile systems. Thus, periodic discussions on denouncing the INF Treaty testify to the existence of potentially official issues with the agreement. The materials provided by such show that that preliminary studies on the possibility of denouncing the INF Treaty are already being carried out.